Quick Note: This publication was written in 2015 to explain why the Canadian dollar was dropping. After reading, you will find an updated snapshot of how the CDN dollar is doing in 2017. This is a basic overview of why the Canadian dollar is dropping in 2015. There has been drastic changes in the currency value all over the world, which has left many countries putting more efforts to increase their currency value. This has not been a walk in the park for most countries due to various factors and limitations that they may face. Most countries have faced challenges in their economy and this has forced them to increase the value of their legal tender. The debts owed to them by foreign countries vs. their struggle to sustain their citizens amid. All the factors have seen the dollar rising but something unique has been cooking in the Canadian economy and the state of it’s currency. Canada depends highly on the American economy, which has enabled it to build institutions and also make its economy grow to being one of the best in the western hemisphere. However, the United States economy has been taking a hit as of late. In addition to this, unemployment rates in Canada has increased, as oil companies in Canada struggle to compete with the rest of the world. The state of Canada’s economy has been greatly affected by oil and it’s relative prices. Recently, the oil price has fallen tremendously from $100 per barrel as recorded last year to $45 this year. This should be great news, right? 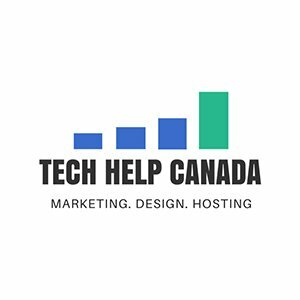 Unfortunately this has led to a drop in the Canadian dollar, as low as 80.70 cent US Dollar which was announced by the Central bank of Canada recently. The drop is relatively low compared to the 82.89 cent mark that was observed in the latest business watch. However it is anticipated that there will be greater falls in the oil prices to about $40 a cask or barrel. Economists believe that this will make the Canadian dollar drop to about 75-Cent loonie. The country’s economic projection has also dropped from 2.4 per cent to 2.1 per cent. However, this has been treated as a risk and insurance against all the changes that have been put in place by the Canadian bank policy action. Our commodity producing nation, Canada, is about to ensnare more housing investors towards the growth of its economy. This also greatly contributed to the dropping of the Canadian dollar this year. This is because there will be low interest rates. These rates have unquestionably boosted the demand of housing and attracted more investors within the country. The country is therefore anticipating more foreign investment as a result of its drop in the relative dollar. The pressure in the drop of the Canadian dollar has also been influenced by the strength of the US Dollar, which has created a negative outlook on the loonie. The strength of the US dollar is a result of the improved state of the US economy and labor. Furthermore, the Canadian export sector could have pushed the drop in the Canadian dollar because of the competitive export business whose demand is very high in the U.S. economy. Goldman Sachs, leading global investment banking, securities and investment management firm, predicts that the Canadian Dollar will continue dropping to as low as 71 cents US by 2017. The above reasons are partly why Canadian dollar is dropping in 2015. We put this together because it was a question that we all needed to understand as citizens and business owners, in order to plan appropriately for the future. 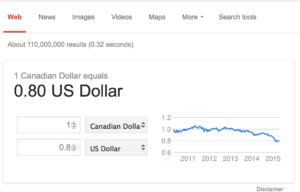 Update: It’s now 2017 and the Canadian dollar is doing a little better than predicted. Here is the latest snapshot from Google. 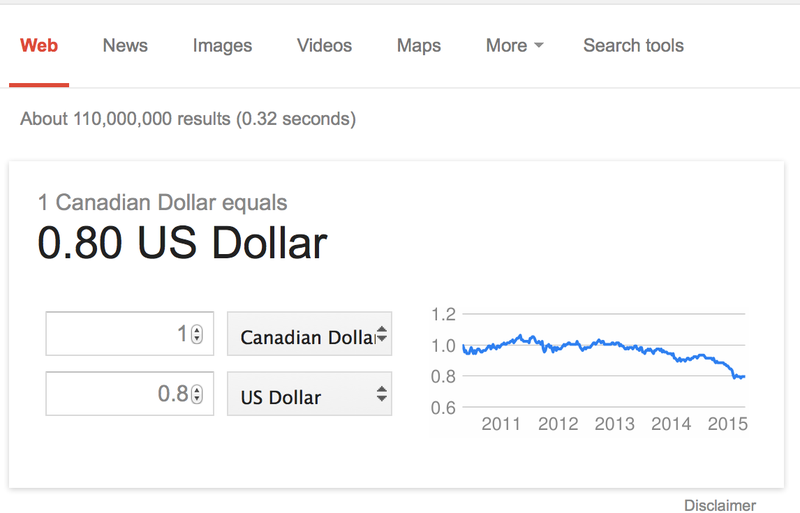 Looking closely at the graph, it looks like the CDN dollar is becoming more stable. In time, we shall see.